Preeclampsia is when a pregnant woman develops high blood pressure, edema and protein in the urine after the 20th week of pregnancy. The exact cause of preeclampsia is unknown. It occurs in about 3% to 7% of all pregnancies. • Vision changes, including temporary blindness, seeing flashing lights or spots, sensitivity to light, and blurry vision. 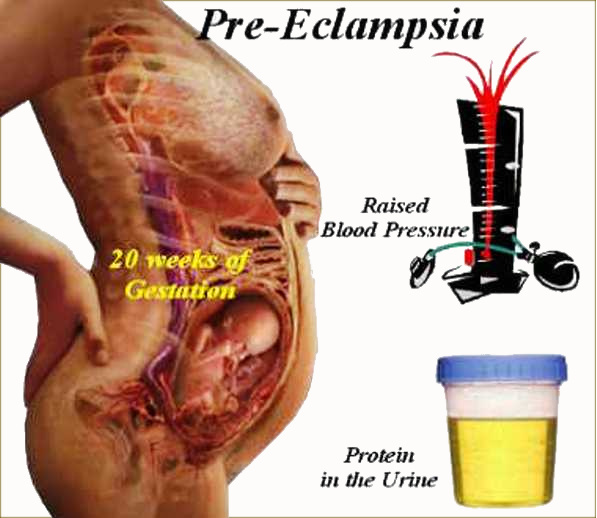 Pre-eclampsia Video - Shows how pre-eclampsia can affect the baby. As a result, your provider may want your baby to be delivered so the preeclampsia does not get worse. You may get medicines to help trigger labor, or you may need a C-section. • Sometimes, a pregnant woman with preeclampsia is admitted to the hospital. This allows the health care team to watch the baby and mother more closely. 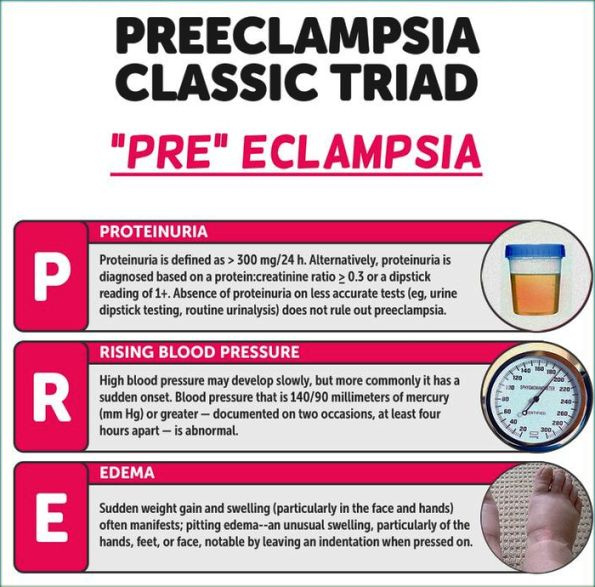 Sign and symptoms of preeclampsia most often go away within 6 weeks after delivery. However, the high blood pressure sometimes gets worse the first few days after delivery. • Call your provider if you have symptoms of preeclampsia during your pregnancy. There is no known way to prevent preeclampsia. It is important for all pregnant women to start prenatal care early and continue it through the pregnancy.